Mar 28, 2014; New York, NY, USA; Iowa State Cyclones forward Dustin Hogue (22) reacts after the against the Connecticut Huskies in the semifinals of the east regional of the 2014 NCAA Mens Basketball Championship tournament at Madison Square Garden. NEW YORK (AP) — Dustin Hogue had the kind of game every New York kid dreams of. The only thing missing at Madison Square Garden was a comeback victory for Iowa State. 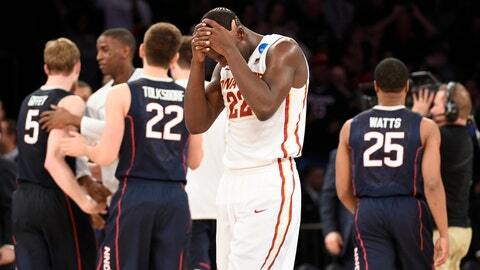 The Cyclones, without injured star Georges Niang, lost 81-76 to seventh-seeded UConn in the Sweet Sixteen on Friday. Hogue scored a career-high 34 points, nearly leading third-seeded Iowa State all the way back after they trailed by 16 with less than 7 minutes left. The Cyclones (28-8) were playing their second game without Niang, their third-leading scorer, who broke his foot in their tournament opener. There was still plenty to celebrate this season: a Big 12 tournament title, the program’s first Sweet Sixteen berth since 2000. "That’s who these guys are, they’re fighters," coach Fred Hoiberg said. "Great chemistry all season long, and to lose a guy like Georges Niang and still go out and beat a North Carolina and have an opportunity after being down 17 tells you everything you need to know about this group of guys." Big 12 player of the year Melvin Ejim was 3 of 13 for seven points, more than 11 below his average. Iowa State still managed to rally to within 67-63 with 2 minutes remaining. But UConn senior Niels Giffey hit a 3 in the corner for his first points since the game’s opening moments, and when the Huskies (29-8) made their free throws in the final minute, the UConn fans packing Madison Square Garden could celebrate. Ejim and DeAndre Kane, Iowa State’s top scorers, were a combined 9 of 31. Hogue, from nearby Yonkers, found plenty of space, shooting 15 for 19. "To play in the Garden, it’s something I dreamed about as a kid," he said. With UConn clinging to a 70-65 lead and less than a minute left, Iowa State’s Naz Long missed a 3-pointer, and 6-foot-1 Shabazz Napier pulled down the rebound and was fouled by Hogue. The guard calmly drilled both free throws. UConn was 20 of 22 from the foul line, while Iowa State was 6 of 15. DeAndre Daniels scored 19 of his 27 points in the second half to lead UConn. Daniels hit his first six shots after halftime, the only Husky to make a field goal for over 8 minutes. His 3-pointer gave the Huskies a 49-32 lead. "DeAndre’s a scorer, and once you feel that you have that confidence, the next shot’s going to go in," Napier said. "We kept feeding him, and he got super hot." Napier, the American Athletic Conference player of the year, drained four early 3-pointers, then made only one more field goal the rest of the way. But the quick start by Napier and backcourt mate Ryan Boatright opened up space for the 6-foot-9 Daniels, an inconsistent junior who can score all over the court when he’s on. Iowa State shot just 31 percent in the first half, missing some good looks but also standing around too much on offense. "Unfortunately in the game of basketball you have nights where that basket looks that big," Hoiberg said, holding his hands far apart, "and sometimes it looks like a little thimble. And unfortunately a few of our guys had that type of night tonight."